Description: Our mix makes an authentic savory salsa with onions, red & green bell peppers, garlic, and Tex-Mex herbs & spices. We've eliminated most of the sodium by switching the salt out with a salt substitute or simply subbing all the salt for extra onion (your choice). Then, we blended in smoky chipotle pepper and rich roasted garlic for a burst of flavor! The result is a low-sodium savory salsa experience that'll have everyone coming back for more. 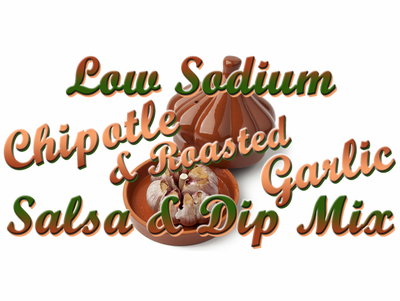 Ingredients: salsa base (onion, red & green bell peppers, garlic, herbs & spices, chili powder), salt substitute or onion, chipotle pepper, roasted garlic. Packaged in a facility that handles wheat, milk, soy, egg, peanuts, and tree nuts.